I'm going to ask for a quick show of hands as to how many of you fellow bloggers write directly into a new post. We all do it sometimes. The best laid plans are all very well but with a rush of inspiration I regularly find myself tapping away and saving my post as a draft... But what if by accident the post then gets lost or deleted? While I have some of my content backed up, some of it is very spur of the moment. What if all of that hard work suddenly ends up evaporating into cyberspace? How to recover a lost blogger post that you never backed up! If you (like me and many others) are used to typing into saved drafts and having 40 tabs open at the same time, it's an easy mistake to make! Typing into the wrong window can suddenly overwrite a lengthy post and lose you valuable content. Combine that with saving and publishing and it can screw your tags, your continuity and all your previous writing will vanish. However, there is a simple solution if you notice your mistake quickly that should help you straighten it all out. Search for your blog on google. I did this to demonstrate so here is what you will see if you try it! Viewing a saved version of your blog! Google for me didn't have posts saved as recently as Sophie's but frankly, I haven't been posting all that much lately so I can understand that! What you view here is a sort of 'remembered' version of your blog from the last time that Google skimmed over it. 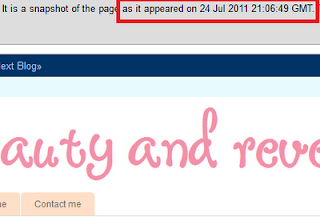 From here you should be able to sift through your content as it was on that date! The grey bar along the top tells you what that date was. Here is a larger image of the bar so you can all see the date. There is also the option on the far right to read some more about the cache system and it explains it far more concisely than I have here! With the ability to look at a saved version of your blog, you also can copy and paste this older saved content back into its rightful draft and move whatever you overwrote it with safely into a new post! While this may seem incredibly simple for those of you who already know it, if this is news to you I hope that it can help in the future if you're ever stuck in the same situation Sophie and I have been in! Even if you haven't backed up your content lately, it's worth checking to see if Google have! Wow, I never knew about that! Thank you so much for that Jenny, it was very helpful! @G A B Y glad that I could share it! Thank you Jenny! I never had this problem, but If I do (hope not) then I'll know what tod o!